The Intel 80286 is the lower middle power microprocessor in the Intel lineup. register sizes, and an extended instruction set. In 1982, Intel introduced the 80286. For the first time, Intel did not simultaneously introduce an 8-bit bus version of this processor (ala 80288). The 80286 introduced some significant microprocessor extensions. Intel continued to extend the instruction set; but more significantly, Intel added four more address lines and a new operating mode called "protected mode." Recall that the number of address lines directly relates to amount of physical that can be addressed by the microprocessor. The 8086, 8088, 80186, and 80188 all contained 20 address lines, giving these processors one megabyte of addressibility (2^20 = 1MB). 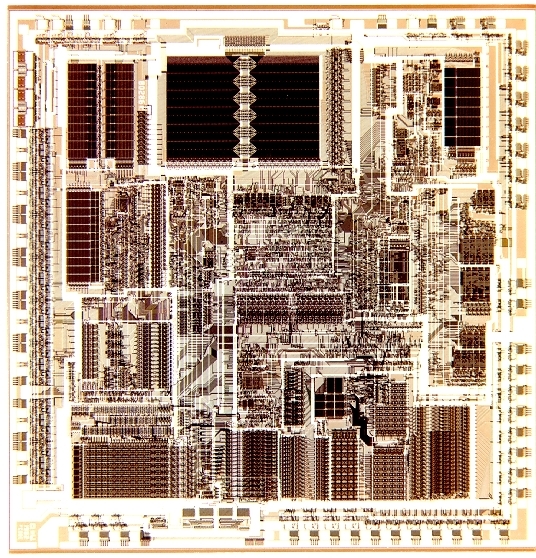 The 80286, with its 24 address lines, gives 16 megabytes of addressibility (2^24 = 16 MB). For the most part, the new instructions of the 80286 were introduced to support the new protected mode. Real mode was still limited to the one megabyte program addressing of the 8086, et al. For all intents and purposes, a program could not take advantage of the 16-megabyte address space without using protected mode. (not so in fact see: LOADALL but the instruction was not publicly documented) Unfortunately, protected mode could not run real-mode (DOS) programs. These limitations thwarted attempts to adopt the 80286 programming extensions for mainstream consumer use. IBM was spurred by the huge success of the IBM PC and decided to use the 80286 in their next generation computer, the IBM PC-AT. However, the PC-AT was not introduced until 1985 -- three years after introduction of the 80286. During the reign of the 80286, the first "chipsets" were introduced. The computer chipset was nothing more than a set of chips that replaced dozens of other peripheral chips, while maintaining identical functionality. Chips and Technologies became one of the first popular chipset companies. Like the IBM PC, the PC-AT was hugely successful for home and business use. Intel continued to second-source the chips to ensure an adequate supply of chips to the computer industry. Intel, AMD, IBM, and Harris were known to produce 80286 chips as OEM products; while Siemens, Fujitsu, and Kruger either cloned it, or were also second-sources. Between these various manufacturers, the 80286 was offered in speeds ranging from 6 MHz to 25 MHz.